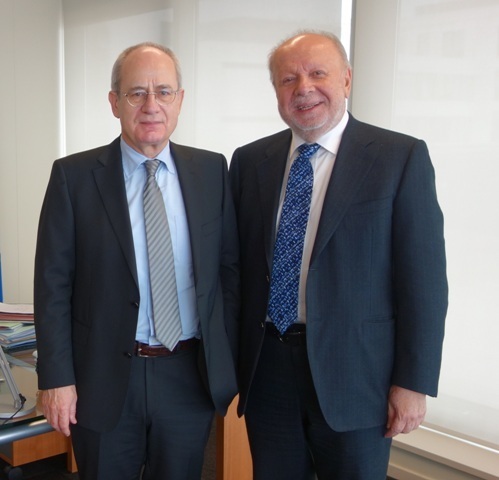 Philippine Ambassador to Portugal Philippe J. Lhuillier pays a courtesy call on Director Wolfgang Götz of the European Monitoring Centre for Drugs and Drug Addiction (EMCDDA) on 21 January 2014. 21 January 2014 – Officials from Philippine Embassy in Lisbon led by Ambassador Philippe J. Lhuillier visited the European Monitoring Centre on Drugs and Drug Addiction (EMCDDA) on 21 January 2014 at its headquarters in Lisbon. Ambassador Lhuillier met with Mr. Wolfgang Götz, EMCDDA Director and Mr. Ignacio Vazquez Molini, Principal Officer for Diplomatic Relations to discuss the latest issues on drugs within the EU and on the global setting. He also suggested the possibility of cooperation between the EMCDDA and the Dangerous Drugs Board or the Philippine Drug Enforcement Agency. During the meeting with EMCDDA officials, Ambassador Lhuillier explained that it was the first visit of the Embassy to the Center since the former opened in 2009. According to him, the visit demonstrates the serious desire of the Philippine Government to address the global problem on drug trafficking.